Do you ever get to a point in a book when you absolutely know that there’s no chance in hell you’re going to finish it? I eat such points for breakfast, lunch and dinner. Or so I thought. 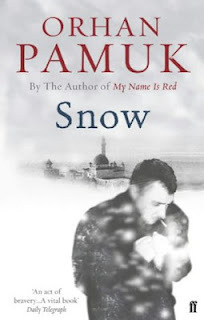 I’m reading Orhan Pamuk’s Snow on my commutes to work and honestly, the last two times I had to try really hard to stop myself from dozing off on the shoulder next to mine. True story. It started off being poetic – The Silence of Snow – when we meet a poet who hasn’t written anything substantial in four years. His name is Ka and he’s going to Kars and in case you aren’t Turkish or a Wikipedia addict, the word for snow in the language is Kar. So we meet Ka (funny, the first few times I read his name I couldn’t help think of Kaa the snake from Kipling’s Jungle Book) who has journeyed all the way to Kars, a decrepit city towards eastern Turkey to cover the local elections and to investigate an “epidemic” of suicides for an Istanbul based newspaper. Or so he’d like to have people believe. In reality, he’s there to find Ipek, a beautiful woman from college whom he wasn’t in love with but remembers as being very beautiful. Maybe if he marries her he will write poems again. Or maybe he'll encounter misery and he'll write really beautiful poems again. If nothing else, at least the strife, poverty and the miserable beauty of snow will intervene. Ka whispered to the girls that Kars was an extraordinarily quiet city. 'That's because we're afraid of our own voices,' said Hande. So where in the book am I as this feeble attempt at a rant is being written? The revolution has begun and having rested his head in Ipek’s lap for a few minutes Ka is on his way to The Rooms of Terror. I don’t know why I’m not inclined to go on. It’s not like I hate the book. If anything, I like it! It’s just that the intensity of the symbolism is getting to me. The poetry of the unfolding plot -- revealing to us all those who die following their conversations with Ka about their dreams and desires blissfully unaware of what is to happen in two hours and twenty seven minutes… Then there’s the snow itself and Ka’s convoluted associations of it with God, the West, the East, love, hope, death , religion, revolution and who knows what else! It’s blanketing everything in its wake, according to the imagery, and yet it isn’t freezing anything stiff. If anything it's serving to unify all the houses, people, themes and motifs. Maybe that was Pamuk’s intention.